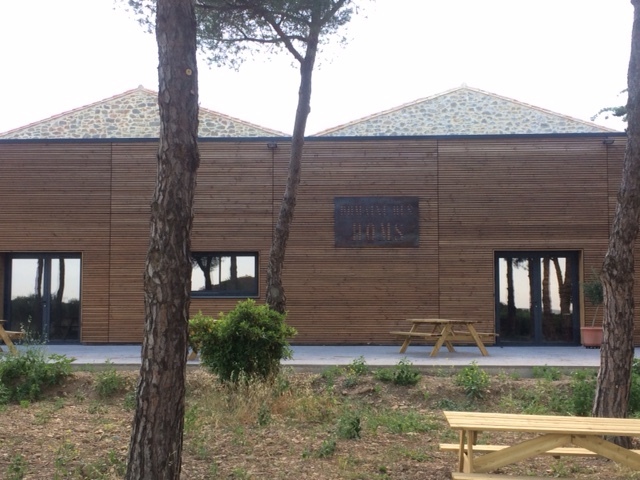 We crossed France, heading due South – today is the visit of the Domaine des Homs in the Minervois! 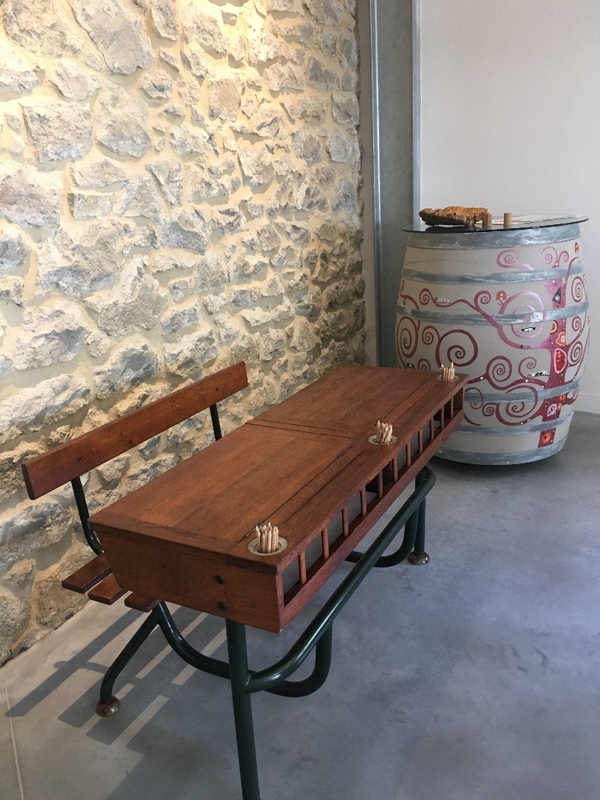 The estate is located on a plateau, and I enjoyed landscapes from Lézignan-Corbières, through Puichéric, an adorable picturesque village. The roads are very narrow, often to allow only one car pass at a time. 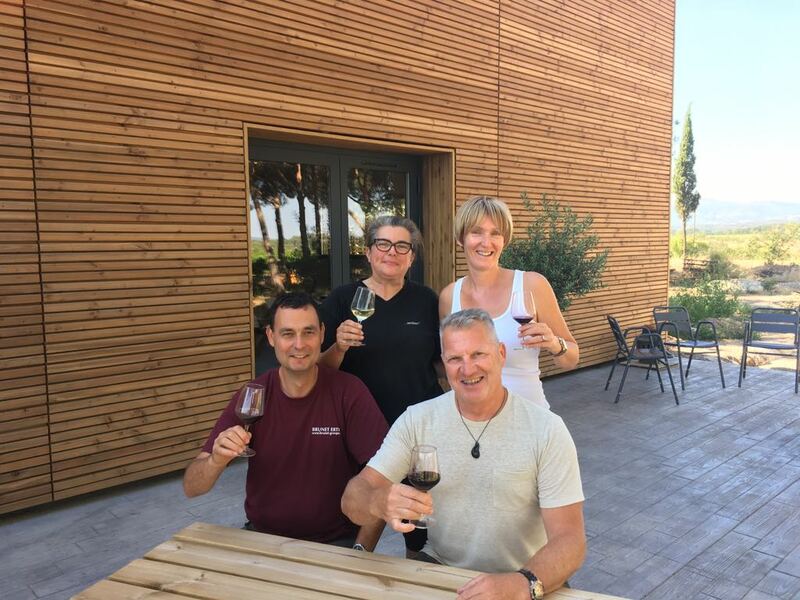 The winding road continues, spanning the Canal du Midi and after a few turns, we arrive at Domaine des Homs, old Roman hamlet where Anne and Jean Marc De Crozals have been located since 2000. 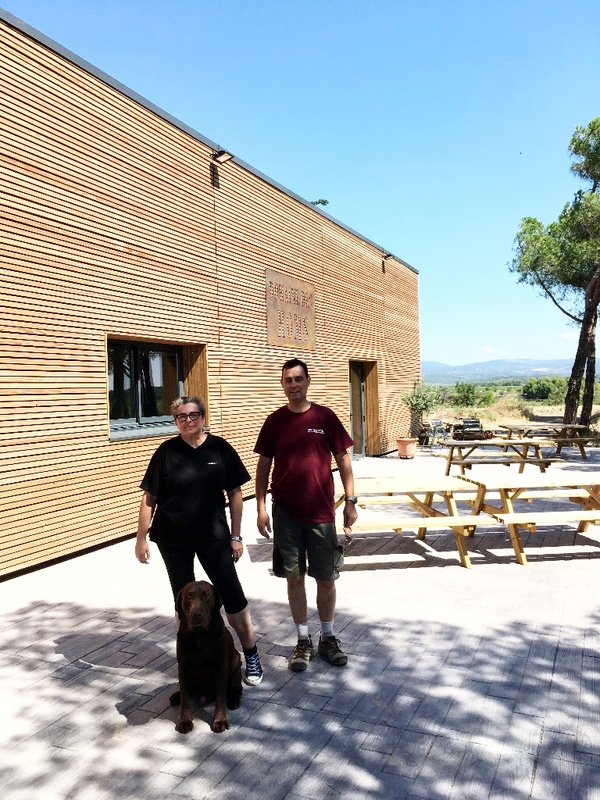 The estate has recently grown with an extension to the Winery – both for tourism and production. 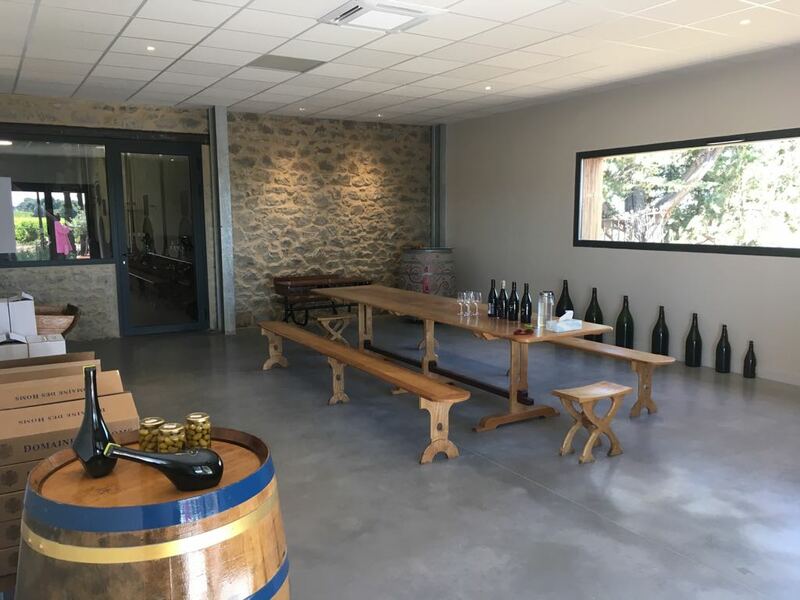 A tasting room with a picture window that frames the Black Mountains, and an outdoor terrace for visitors to relax with a glass of wine and enjoy the countryside. After a year under construction, we were eager to test out the patio and we can assure you, relaxation and serenity comes very quickly. 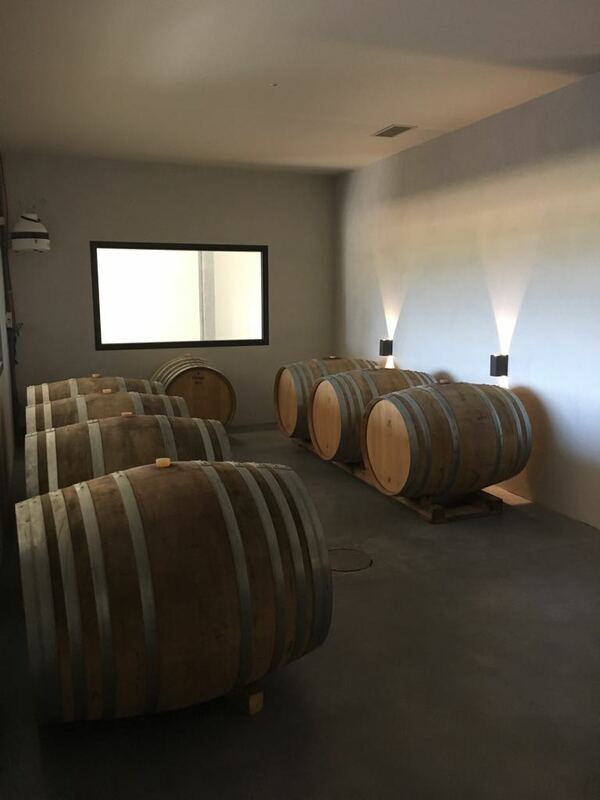 Thanks to the addition of a barrel cellar and a bottle storage space for the production side of the winery, the estate can now store the red wines one year before sale to let the tannins continue to refine in the bottle. The Paul and Gravières de Sancastel cuvées, made from a majority of Syrah, have especially benefitted from this extra ageing opportunity. Vintage 2018: Incredibly wet after a very dry winter! Indeed, the months of December to February which are normally rainy and allow to refill the water tables were incredibly dr. Not a single drop of rain had fallen. 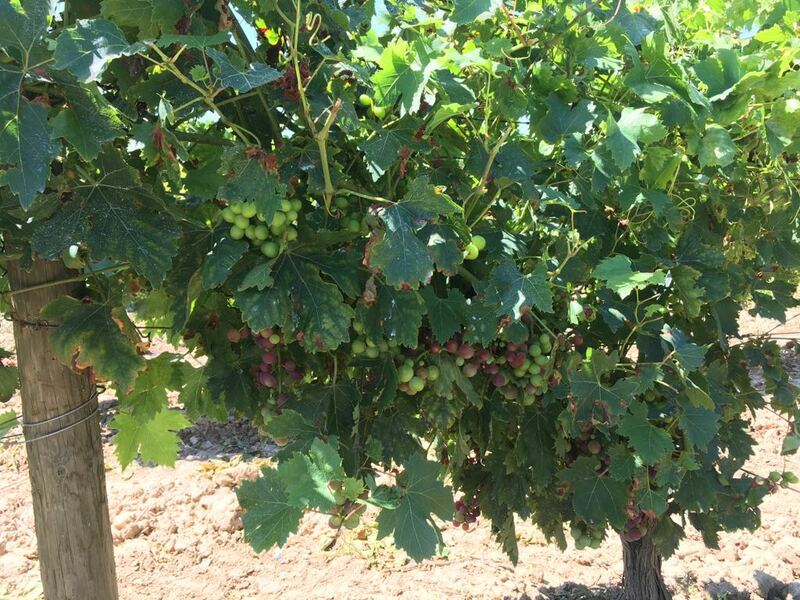 The vine growers of the region were very worried at the size of the coming harvest, because to have a year of drought after those of difficult years of 2016 and 2017 would have been catastrophic. The month of April saw the rains arrive and settle … The water that had not fallen throughout winter, finally came and filled the water tables. And it rained. And it rained. The two months of April and May did not stop raining. This was worrisome as the month of May is also that of the flowering of the vine – a crucial moment to prepare the fruits of the harvest and also sensitive and fragile period. The mildew pressure was very strong during these two months in particular – if the Mildew develops on the flowers, the whole crop is lost. Jean Marc never left his guard during the months of April, May and June. The vineyards being in organic production, meaning only surface products are allowed – unfortunately they are also washable! Jean Marc has copper to help, and treated every 10 days to contain the disease. Of the 20.5 hectares currently in production at the estate, it takes 3 days of treatment to cover the entire vineyard. Jean Marc’s 80-year-old father had never seen so much mildew in his entire career! Morels were growing in the vines, so there was pressure on the mushrooms too (like the Mildew) !! It is a real battle that he fought, and also WON. 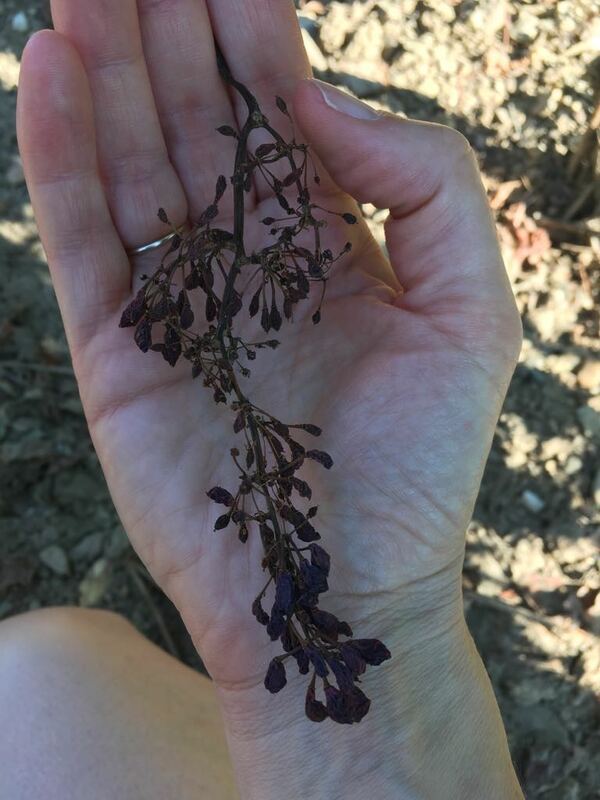 Only a a small part of the harvest is lost, and we find in the vineyards a few grape clusters here and there completely roasted, victims of the mildew battle. 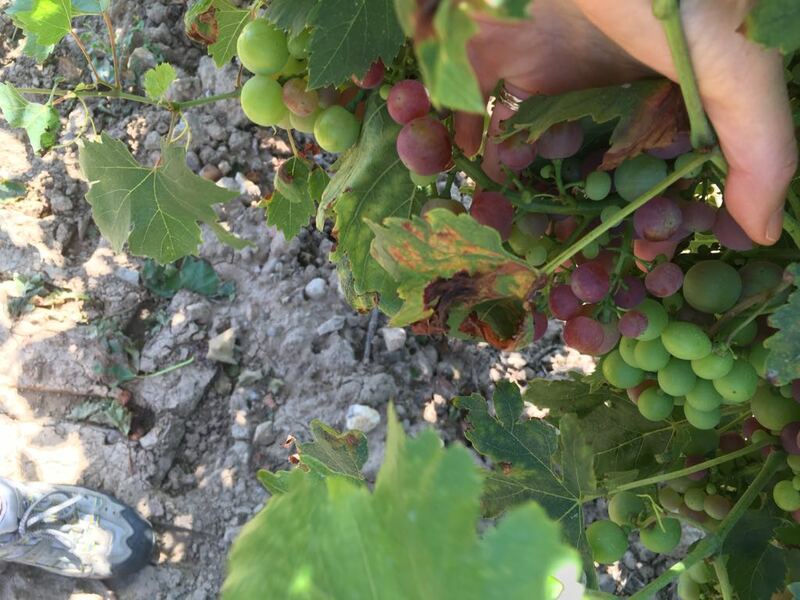 All the grape varieties did not react in the same way; the Viognier for example was very resistant, thus very little affected by the Mildew and it will be a beautiful harvest for 2018. The Chardonnay was touched lightly. The Syrah has succeeded as the Viognier, and has resisted well – that harvest looks good. However Grenache and Cinsault, typical grape varieties of the region, are very sensitive to the disease and the losses mainly concern these two grape varieties. It is compensated for the field of Homs by the absence of coulure, also the volumes should be the same as those of 2017. 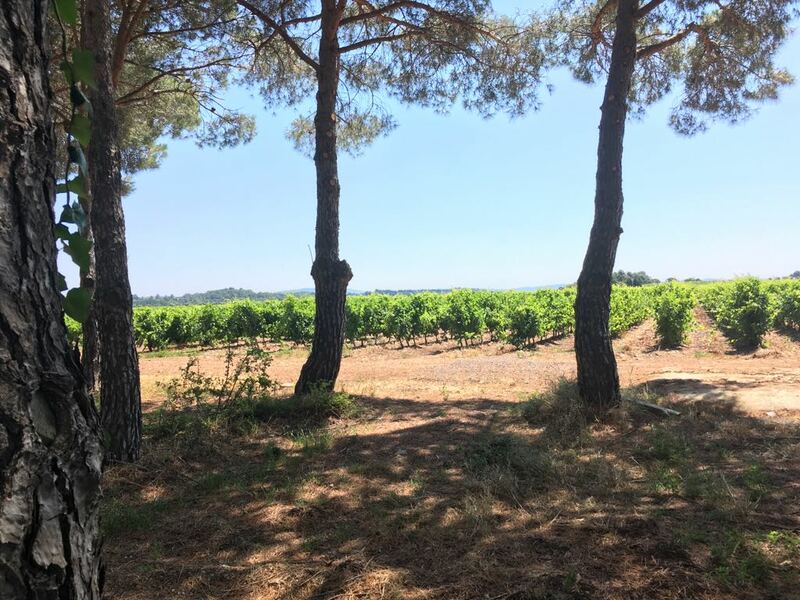 In mid-June, the rains finally stopped, reviving the spirits of Jean Marc who doubted he could continue to drive his vines according to the principles of organic farming. The wind picked up, drying the leaves and fruits, the sun settled and the heat too. These last few days are scorching. 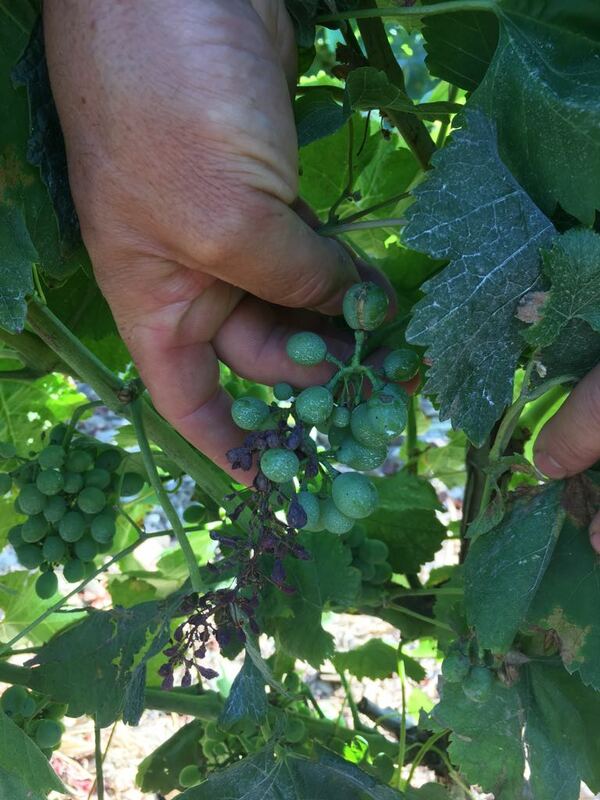 The visit coincided with the very beginning of veraison of Syrah. This year should have more normal harvest dates after several years of early harvest. 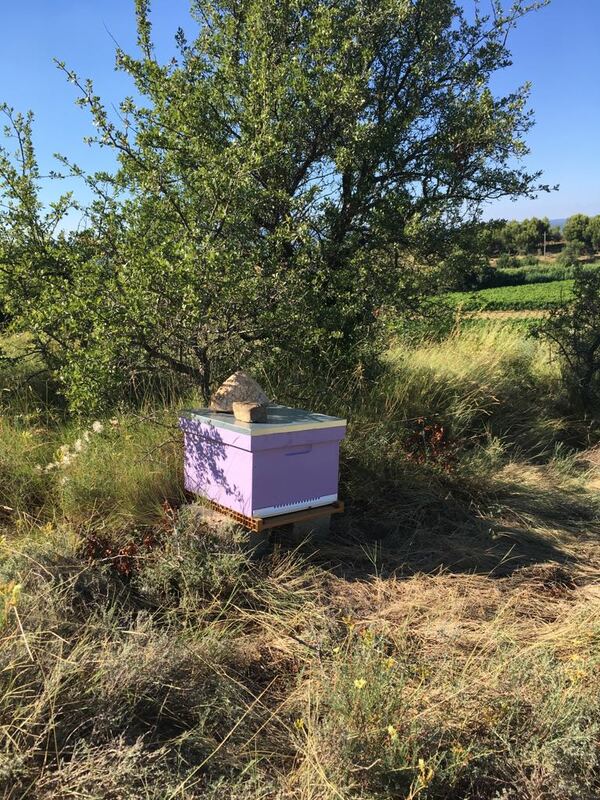 It has been several years since Jean Marc spoke about it, this is now done : hives have arrived at Homs! 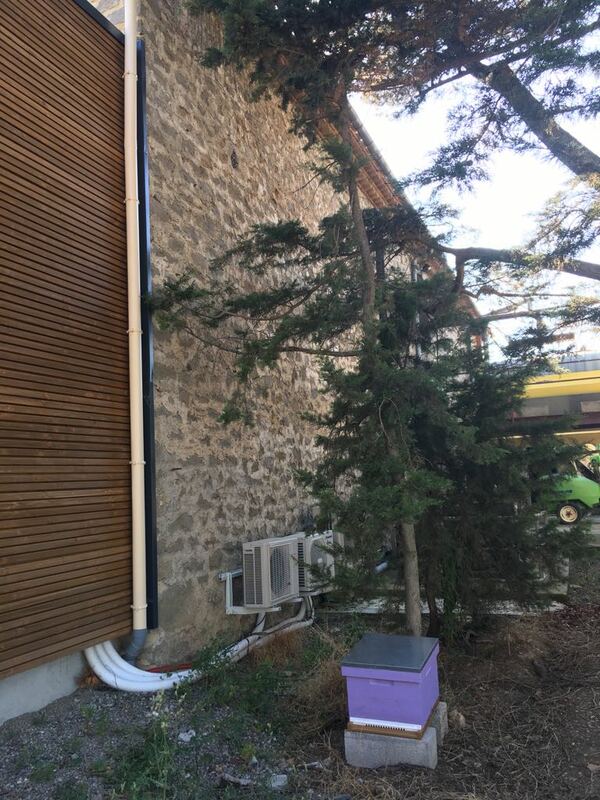 And the bees are already there ! 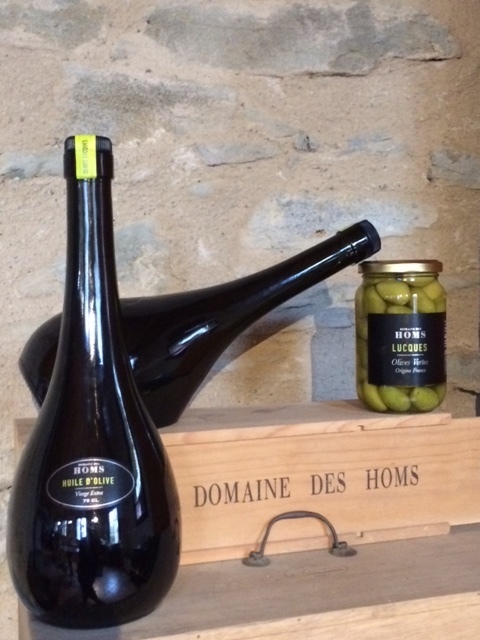 No doubt, after the production of wines, almonds, olive oil and olives … honey will be the next delight on the domaine des Homs list! Last creation of Jean Marc, a light bubble with 5 ° alcohol from Muscat Petit Grain. Floral, delicate nose, fresh mouth, very nice sugar / acid balance, very clean finish. A very ripe nose with hints of gingerbread, slight touch of ageing very well integrated. The nose is crisp, the mouth fresh with notes of very ripe white fruit, pear, peach. Finishes very clean. Very aromatic nose, mouth on notes of apricot well marked, the mouth remains tense, dry, very palatable, and mineral with a saline point in the final. Very ripe fruit, crushed strawberry – velvety, suave texture. Good concentration on the palate, rich and balanced, no tannic aggressiveness. Discreet and fruity nose, juicy and unctuous, very aromatic on red fruits. The wine has won a lot with a year of bottling. Toasted nose with notes of coffee, very smooth wine due to very fine tannic grain, aromatic notes on black fruits, pepper, cacao nibs.